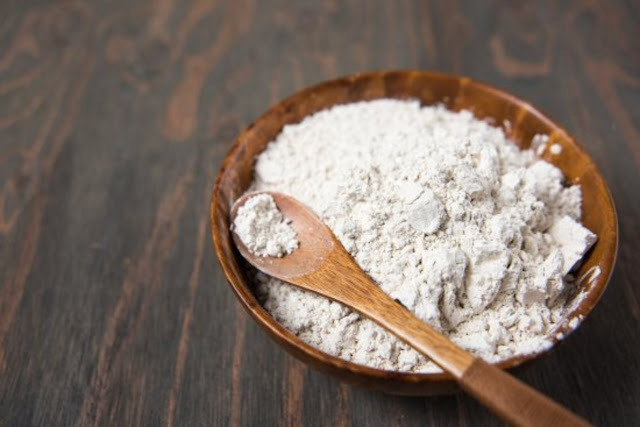 Diatomaceous Earth (also called fossil shell flour or diatomite, after the biological genesis of this material and also has the German name of kieselgur, meaning a flint from the water sediment) is a material found in sedimentary rocks. It occurs naturally in sea-beds (Saltwater DE) or dried floors of lakes and rivers (Freshwater DE), and is a soft material rich in silica that easily crumbles into a powdery form. Diatomite primarily comprises of the fossils of hard-shelled algae or one-celled plants (phytoplankton) and has multiple industrial and household uses. The chemical name of Diatomaceous Earth is ‘Diatomaceous silica’ and its chemical formula is SiO2.nH2O. SiO2 is 86.30% by weight, while other compounds present as Al2O3 (4.50%), Fe2O3 (1.57%) and CaO (1.43%). Its dry density is in the range of 9.0 and 13.0 pounds per cubic feet, is typically off-white in color, and a pH value between 7 to 10. Particle size of diatomite is generally finer than 45 microns, and can be as low as microns. Diatomaceous Earth has many applications. Absorbing nitroglycerine in diatomite makes it more stable, and this mixture is very commonly known as dynamite. Since it has high porosity and contains microscopically small hollow particles, it is very commonly used as a filtering medium in swimming pools, water treatment plants and fish tanks. Further, this fine powder structure can absorb lipids from the waxy outer layer of insects and is therefore also used as a pesticide and in agriculture. Diatomite is also a commonly used abrasive, and given its low conductivity, as an insulator as well. Diatomaceous Earth has high absorbing property and can dry out hands and skin, because of which it should not be handled without gloves or appropriate cover for protection. Certain varieties of diatomite (particularly the flux-calcined form) have higher concentrations of sharp-edged crystalline silica, which can result in severe respiratory problems and silicosis, and even cancer of the lungs, if a person gets exposed to it without wearing a dust mask. As a result, the Occupational Safety and Health Administration Department of the United States (OSHA) even regulates the level of crystalline silica that can be present in the dust particulate. Even with small exposure, it can result in the irritation of the eye and skin. Certain algae found in the coastal waters, and which constitute the diatomite, have resulted in severe pollution, and a few species also known to produce domoic acid (which is a nerve poison that can quickly causes death to many fauna, if ingested).